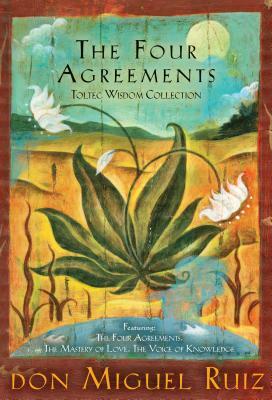 This handsome boxed set by bestselling author don Miguel Ruiz offers three of his most widely acclaimed works:THE FOUR AGREEMENTS: A Practical Guide to Personal Freedom Don Miguel Ruiz reveals the source of self-limiting beliefs that rob us of joy and create needless suffering. Based on ancient Toltec wisdom, The Four Agreements offer a powerful code of conduct that can rapidly transform our lives to a new experience of freedom, true happiness, and love.THE MASTERY OF LOVE: A Practical Guide to the Art of Relationship Don Miguel Ruiz illuminates the fear-based beliefs and assumptions that undermine love and lead to suffering and drama in our relationships. Using insightful stories to bring his message to life, Ruiz shows us how to heal our emotional wounds, recover the freedom and joy that are our birthright, and restore the spirit of playfulness that is vital to loving relationships.THE VOICE OF KNOWLEDGE: A Practical Guide to Inner Peace Don Miguel Ruiz reminds us of a profound and simple truth: The only way to end our emotional suffering and restore our joy in living is to stop believing in lies — mainly about ourselves. Based on ancient Toltec wisdom, this breakthrough book shows us how to recover our faith in the truth and return to our own common sense.